The National Institutes of Natural Sciences National Institute for Fusion Science has developed a high-speed two-dimensional microwave camera for performing diagnostics of high-temperature plasma. By using microwaves to penetrate through fog, clothing, walls, and soil, application of this camera is anticipated for safe passage through dense fog, underground exploration, non-destructive investigation, and other industrial fields. In the Large Helical Device (LHD) at the National Institute for Fusion Science we generate high-temperature plasmas that exceed 100,000,000 degrees Celsius. Microwaves are used to measure the density and fluctuations of a plasma. Until now, in the United States plasma diagnostics have been performed using one-dimensional microwave imaging sensors. But if two-dimensional microwave imaging sensors were to be developed, the amount of information that could be obtained through a single diagnostic would greatly increase. Thus, it is necessary to arrange one-dimensional sensors that detect microwaves in rows. However, arranging these sensors in rows caused mutual interference between each sensor, and the problem of obtaining accurate information appeared. Further, earlier microwave imaging utilized a radar method or a scanner method that scanned using a one-dimensional sensor, and these methods moved at very low speeds. 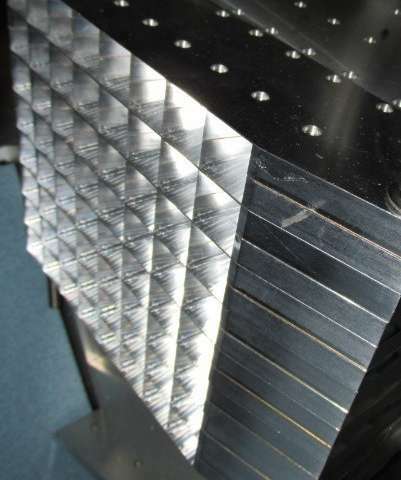 Professor Yoshio Nagayama, of the National Institute for Fusion Science, and his colleagues, in collaborative research with Kansai University, Tokyo University of Agriculture and Technology, Ube National College of Technology, the Institute for Molecular Science, Kyushu University, and other institutions, solved the problem of mutual interference between each sensor by using aluminum plates and devising an internal structure. 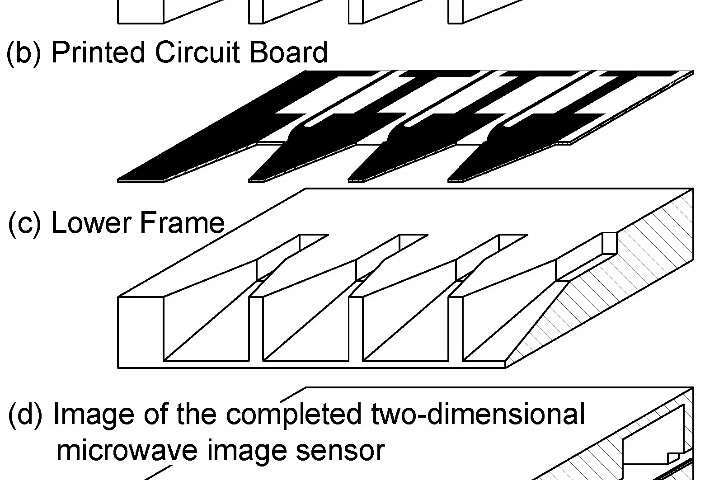 And they developed a two-dimensional microwave image sensor (images 1 and 2) with 8x8 image pixels that can detect microwaves at high-speed and at high-sensitivity. Based upon these improvements, for the first time in the world, they succeeded in high-speed photography of LHD plasmas of nearly 100,000,000 degrees Celsius at 1,000,000 frames per second. This two-dimensional microwave image sensor that has been developed is composed of 64 individual sensors. However, the previous problem of mutual interference between each sensor does not, in principle, occur. Further, in the diagnostic methods that utilized microwaves, the important indices of "strength" and "phase" can be diagnosed simultaneously. Due to these special features, broad application of this sensor in industries is anticipated. Regarding this technology, in order for it to become widely known in academia and industry, benefiting from the cooperation of Associate Professor Soichiro Yamaguchi, of Kansai University, we have constructed a high-speed microwave color television that converts diagnostics data into images. At "Innovation Japan 2015: University Trade Fare & Business Matching," which was held in Tokyo on August 27-28, 2015, our demonstrations received much praise from the industrial world. Microwaves pass through fog and clothing. Accident prevention radar is placed on airplanes and boats. However, in utilizing the microwave camera developed in this collaborative research project, even in poor atmospheric conditions such as dense fog, one can confirm the location of other airplanes and other ships more quickly and more precisely. And it will be possible to dramatically improve the safety of movement. Further, this will be used at safety inspection places at airports, and it will become possible to discover in a short time weapons and metal objects hidden in clothing. Further, because microwaves pass through soil and concrete walls, work efficiency can be greatly improved by application to the search for metals underground and for non-destructive inspection. The number of pixels in the image sensor developed in this research is sufficient for high-temperature plasma diagnostics. But it will be necessary to increase the number of pixels for industrial applications. In the future, gaining the cooperation of experts in electronic circuits, we plan to advance the development of high number of pixel sensors. Microwave imaging began from fusion plasma diagnostics. In the future, development toward new image diagnosis technology in industrial fields is anticipated.